Previous: Previous post: Analysis of recordings of single-unit firing and population activity in the dorsal subiculum of unrestrained, freely moving rats. Next: Next post: Is Long-Term Potentiation (LTP) going out of fashion? And is Synaptic Plasticity now in? Take-home messages: The projection from hippocampal area CA1 to the subiculum sustains long-term potentiation in vivo [download the paper], and LTP reduces paired-pulse facilitation in this pathway [download the paper]. The subiculum continues to be underexplored relative to the rest of the hippocampal formation, despite its interesting connections with the anterior thalamus, among regions. The projection from hippocampal area CA1 to the subiculum sustains long-term potentiation. Commins S, Gigg J, Anderson M, O’Mara SM. Interaction between paired-pulse facilitation and long-term potentiation in the projection from hippocampal area CA1 to the subiculum. 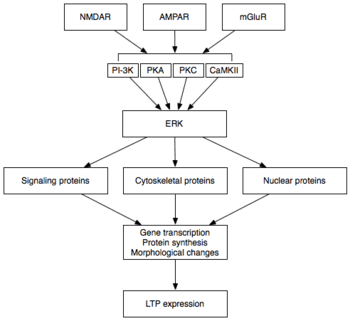 Studies of the interaction between long-term potentiation (LTP) and paired-pulse facilitation (PPF) may throw light on the role of presynaptic factors in LTP. We examine here, for the first time, the nature of PPF in the CA1-subiculum projection. PPF peaks at a 50 ms interstimulus interval (ISI) and is evident at ISIs from 10 to 500 ms. There is no PPF effect at a 1000 ms ISI. PPF decreases in magnitude post-LTP induction across the middle range of ISI values tested (30, 50 and 100 ms). There is a positive correlation between initial PPF values and LTP; this correlation increases as the ISI increases. Initial values and the change in PPF post-LTP are also negatively correlated. Analysis of recordings of single-unit firing and population activity in the dorsal subiculum of unrestrained, freely moving rats. Differential regulation of synaptic plasticity of the hippocampal and the hypothalamic inputs to the anterior thalamus. Responses of dorsal subicular neurons of rats during object exploration in an extended environment. Stability of subicular place fields across multiple light and dark transitions.